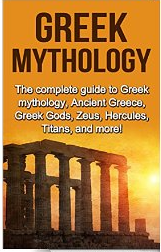 Greek Mythology: The complete guide to Greek Mythology, Ancient Greece, Greek Gods, Zeus, Hercules, Titans, and more! That title is quite a mouthful! This kindle book will give the reader a bird’s eye view of Greek mythology, its history, and a few examples. Greek myths have been around since approximately 900 B.C. They played an extraordinary role in the growth of politics, religion, and social life of the ancient world. 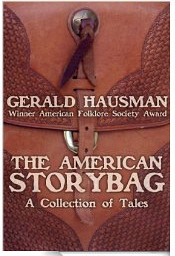 Much of our modern day literature reflects their influence. The author divides the Greek mythological world into three periods: the age of the Gods, the age of Gods and Mortals, and the Age of Heroes. He explains the ancient Greek religion and gives a brief summary of the gods and their equivalents in later Roman mythology. Then Plesiotis goes into detail about some of the more popular heroes like Hercules and the twelve labors he was forced to perform. One chapter explores the Trojan War and the famous Trojan horse ploy used to defeat the Spartans. Prometheus is a Titan who was particularly close to mankind. The author describes how this Titan bestowed the gifts of fire, husbandry, and metalwork upon man. This twenty some odd page digital book is my no means a definitive guide, but is a great reference for a middle grade school report or introduction to further exploration of Greek and Roman mythology. It would have benefited from a few illustrations to accompany the stories, but I would still recommend this book as a well-written clear reference guide for children and adults age eight and up who have an interest in the subject. The author is a college teacher who has spent many years researching emotional intelligence, ethics and mindfulness in leadership. In this short book she manages to produce a comprehensive guide and discussion on the subject for children in the elementary grades. The colorful multicultural graphics are simple and the text is appropriate for early readers. Kremers begins with a definition of leadership. A leader looks at the outside universe but knows we must look inside first and follow our heart. The leader never leaves the heart at home and acknowledges responsibility for herself and others. A boss is not the same as a leader because a leader connects with her team before correcting them. The leader creates a culture where team members can feel safe, respected, happy, and successful. Leaders bring out the best in others and support members in success and failure. Any person can become a leader when making a good decision that allows others to join in their project. 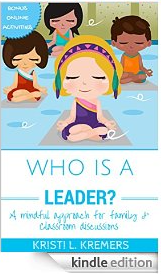 Next the author names leaders children might be familiar with: parents, teachers, and preachers. She uses the leadership profiles of Dr. Martin Luther King, Jr., Mother Theresa, and Dr. Neil De Grasse Tyson as biographical examples. At the end of the book there are three separate discussion guides for families, kids, and classroom. The questions within these can be modified or adapted depending on the age of participants. This forty page book provides a mini management training seminar for children and boosts self esteem. Recommended especially for children ages six through ten. First book in a new middle grade series that mixes medieval history, knights, castles, adventure and coming of age with a modern twist. Protagonist Simon Sharp is a fourteen year old who becomes an orphan at the age of twelve when his archaeologist parents die in an airplane crash over Scotland. Simon finds himself in a New York City orphanage and foster care. He is clever, smart and streetwise, though he is bullied by Brad. When strangers ask how his parents died, he replies, “King Arthur killed them.” Their lifelong mission had been to find Camelot. Simon’s unlucky situation becomes more mysterious, when he gets a letter from an uncle in Scotland who claims that he has just found out about the accident and will assume responsibility for Simon. The boy is soon on a plane to Scotland and a new life in a mysterious castle. Though he now attends a private school, the bullying situation is the same. Simon will discover hidden passages and meet mysterious creatures like gargoyles, trolls, and magicians. Who are they and what is his connection to them? This book of slightly less than one hundred pages has charming black and white illustrations that add to the depth of the characters and setting of the tale. The writing of the plot is well-executed and the characters are interesting and endearing. 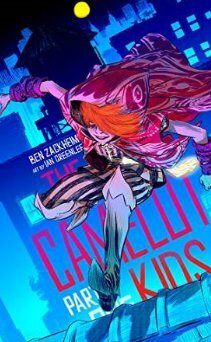 Zackheim seems to have found the right combination of modern day grit and medieval fantasy in setting the right tone for the series. I think tweens and teens will want to get involved with this story. I know that many adults like me have fond memories of Camelot. Frankie Dupont is a pint-sized detective who wears a fedora and is accompanied by his trusty dog, Sherlock. His dad, Inspector Cluesome, has provided the incentive for his ten year old son to follow in his footsteps. In his first book of adventures, Frankie solved the mystery of Elderby Manor. He returns to that setting in Book 2 to solve the mystery of what happened to the lemon orchard. At the outset the reader meets Frankie and Sherlock attending the new composite class at Maizon Valley Elementary School. His cousin, Kat, and friend Amy will again use their smarts to help Frankie solve the case. Almost as soon as class begins, Miss Chestnut presents a lemon meringue pie to the new head teacher, Mr. Mulberry, who immediately becomes ill. Frankie is determined to find out why. 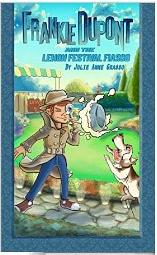 When Miss Chestnut brings the class to the lemon orchard at Elderby Manor to pick lemons for the festival, everyone living and working there is under suspicion, One by one Frankie and his friends interrogate suspects and use their detective equipment to eliminate the innocent and find the culprit. There are enough twists and turns to keep the plot interesting and the reader guessing, and the characters are believable and humorous. The illustrator, Andrew Avellino, presents charming pencil drawings for each chapter. Book length is just around 100 pages, perfect for the eight to twelve age group. Look forward to joining Frankie again in Book 3 when the science fair will be sabotaged. Available in kindle and paperback editions. If you enjoyed reading this post, please subscribe by clicking on the word Follow or by hitting the orange RSS FEED button in the right hand corner of the page. 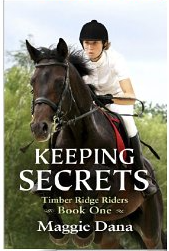 First in a series of books featuring young teens and their love of horses. Kate is fourteen and spending her summer with her aunt because her father is a lepidopterist who is busy chasing butterflies in Brazil. Looking for something to keep her occupied, Kate applies for a summer job as a companion for a teen named Holly. Holly is now wheelchair bound as a result of a horseback riding accident. Kate has a dark secret. She was blamed for the death of a horse in her care. Now she is petrified to go near a horse stall. Holly’s mom gives riding lessons and coaches an equestrian team. Kate hopes to steer clear of the barn, but she is gradually drawn to it. She must overcome the bullying of Angela, a spoiled brat whose wealthy mother accepts nothing less than first place. Quite a few shenanigans involved in the plot. Dana succeeds in making the reader identify with her characters. The love of horses and its power on the main characters are carefully woven into the plot. Just a hint of romance with the introduction of a young teen male character. 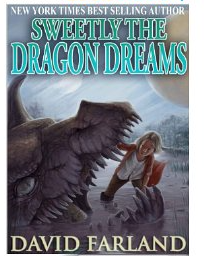 This story is just under two hundred pages with vocabulary and plot lines that are suitable for readers age nine and older. The book is well-written with a nice mix of descriptive language and dialogue. Teachers might break the book up into chapters for read aloud and class discussion. If you enjoyed this post, please subscribe by clicking on the word Follow or by hitting the orange RSS FEED in the upper right hand corner of this page.